Ideal for high-density applications, the Osprey 827e card features two independent, highly configurable input channels. Ideal for high-density applications, the Osprey 845e card features four independent, highly configurable input channels. All inputs are clock independent, which allows for different input formats on each input. 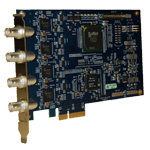 Ideal for high-density applications, the Osprey 840e card features four independent, highly configurable input channels. Ideal for high-density applications, the Osprey 825e card features two independent, highly configurable input channels.. 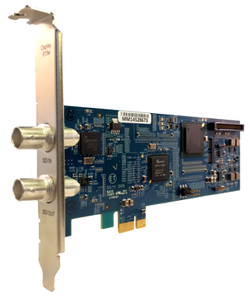 Perfect for lecture capture and similar applications, the Osprey 820e card can capture video from HDMI or DVI video as well as capturing from analog and digital VGA sources. 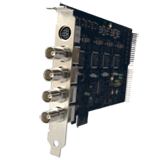 The Osprey 800a audio input card provides increased flexibility with up to four stereo channels of audio. Simply attach it to an Osprey 820e, 815e, 825e and 845e for improved audio performance. 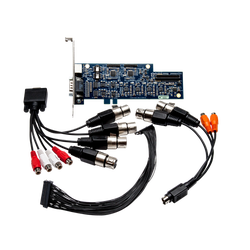 This audio input card also offers additional external audio inputs such as balanced, unbalanced, AES/EBU, and SPDIF. With up to four stereo channels of audio, the Osprey 800a now provides greater flexibility for input audio signals. Two stereo channels of balanced audio are always available. Plus, you can configure two additional stereo channels as either unbalanced, AES/EBU, or SPDIF. The 800a can be purchased with an 800e Series capture card, or as a separate item to expand your existing product. 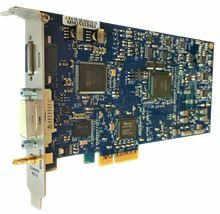 It connects directly to the 820e, 815e, 825e and 845e requiring no PCIe connection of its own. Support for the 800a is already included in the drivers for the 800e series capture card so no additional drivers are needed. 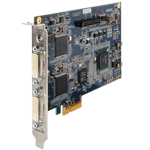 Ideal for high-density applications, the Osprey 815e card features a single input plus a pass through output. 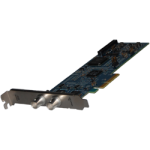 Ideal for high-density applications, the Osprey 815e card features a single input.